I had a flash back of my parents attic and all the goodies that lay unearthed in there and remembered these two amazing lamps that used to belong to my Grandma. So on a recent trip home I marched right up there and found my treasure. Now of course is the time that my Dad informs me I can not have them, that they are pretty and might be used in the house....someday. Gotta love my Mom for laughing at him and telling him that if they have not been used in the last 10 years that they were up there, they were not going to get used now and that I may have them...yippie!! You cant really see all the detail from these pictures, but they have this awesome Asian scene carved in the sides...the detail on them is amazing! 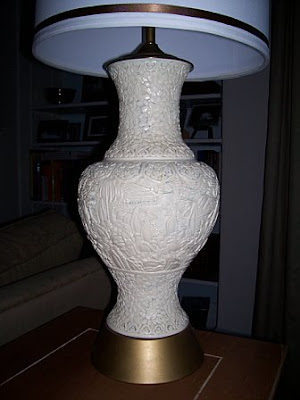 YUP- your eyes are not playing tricks on you...that's right people they are selling on this site for $600...PER LAMP!! 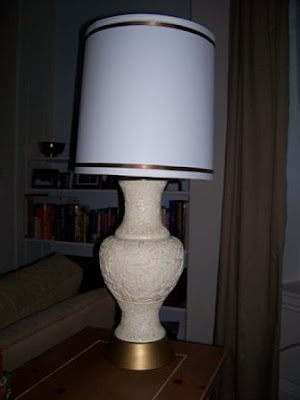 How psyched am I that I scored not just one, but TWO way cool lamps for free! Makes me wonder what other treasures are hiding up in my parents attic....you better believe I'm going to do some digging next time I'm home.